1913 Bath House Inventory, p. 35, no. 196, in the Red Room, in the 'large glazed case near door - Right Hand Division', erroneously describing the finial as 'Hecules and the Nemaean Lion'. 1914 Wernher Inventory, p. 35, no. 185, also erroneously describing the finial as 'Hercules and Nemaean Lion'. The finial is formed as Samson demonstrating his super-human strength by slaying a young lion that roared at him. He is shown forcing open the jaws of the animal. The medallion in the base of the bowl is chased with a scene of Samson carrying the city gates of Gaza. The Philistines had planned to ambush him at dawn at the city gates, when they knew he would take leave of a prostitute with whom he regularly spent the night. Samson however outwitted them by getting up at midnight. He wrenched up the city gates and the two gate posts and carried them thirty miles to a hilltop near Hebron. In the Late Medieval and Renaissance periods both these actions by Samson were seen as prefiguring those of Christ. The wrenching of the jaws was seen as foreshadowing Christ's descent into Hell and opening the gates to release the Just, who had died before the Incarnation. The carrying of the gates by Samson presaged Christ bearing the Cross on the Via Dolorosa and the Resurrection, when He burst forth from the tomb (V. Metford, Dictionary of Christian Lore and Legend, London, 1985). 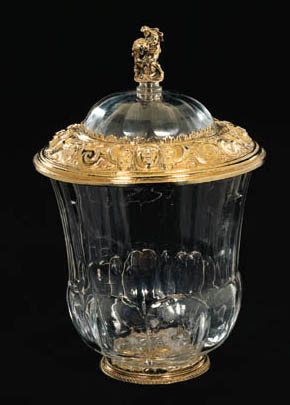 This covered rock crystal bowl is of exceptional quality and may well have been a royal commission. In the same way that Hercules was 'adopted' by King François I in France as a symbol of his power and authority, it seems likely that Samson would have been similarly adopted by one of the German monarchs, particularly in a time of intense religious conflict.